As of May 2017, Ladore no longer hosts Wedding Ceremonies. Ladore is a fantastic venue for a wedding reception with its picturesque countryside, rolling hills and a scenic lake. The photo options are limited only by your imagination. 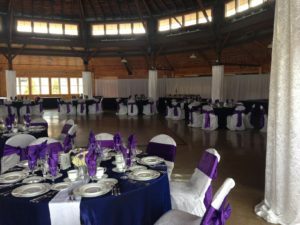 Numerous couples have found Ladore the ideal location for their wedding reception. If you are interested in holding your special event at Ladore, we suggest call with a few possible dates. Call Barb at (570)488-6129 Ext 156. *Please note that Ladore is totally alcohol free. Wedding Cake is the responsibility of the Bride and Groom and is not included in this price. Ladore will be happy to supply a rolling table and will dissemble and plate. If your baker requires refrigerator space before the event please let us know. An Advance Deposit of $500.00 is required with signed paperwork when booked. 90 days before the event 1/2 is due and the balance is due 7 days before the event with an accurate count. Final price is based on the final count. Payment by Credit Card (Master Card, Visa or Discover. We do not accept American Express) – no credit card can be charged for more than $1000.00. You are responsible to provide and place center pieces, favors & name cards on the tables. You are responsible to provide decorations and to decorate – if any of the decorating includes the use of a ladder that would need to be done by the Ladore Maintenance Dept. You will need to provide Ladore with a hand written plan of your decorating beforehand so the staff can plan their schedules. The additional cost for this is will be $30.00 per hour. You are responsible to gather and remove all your items at the end of the event. Again if it requries a ladder; Ladore’s Maintenance department will handle that and it will be $30.00 per hour. Ladore is not responsible for any breakage or loss of items that are left behind. Risers are available at a cost of $50.00 per section. Advance notice is needed for this item.